The Top End’s newest fishing tourism operation, Dhipirri Barra & Sportfishing Lodge Arnhemland, has taken delivery of four custom-built Bar Crusher 615XS Guide series boats just in time for the run-off barra season. Built on Bar Crusher’s popular 615 Gen2™ hull to 2D marine survey, each boat incorporates six watertight buoyancy compartments, which makes the deep-V hull virtually unsinkable, while retaining its unique Quickflow water ballast system for superior stability at rest. Bar Crusher director Peter Cleland said the team worked closely with Dhipirri Barra & Sportfishing Lodge Arnhemland proprietors Darren and Sharon Nickolls to ensure the 615XS Guide series met their stringent requirements and expectations. “Having operated Darren’s Northern Territory Barra Safaris for over 15 years, Darren knows what he wants and needs in a boat,” Mr Cleland said. “With the new operation based in remote Arnhem Land, those requirements are stepped-up yet another level. “Bar Crusher’s strength, performance and premium construction were a good base to start from, with the custom fit-out including more inter-changeable seating for clients, bow-mounted electric motor, multiple batteries and an independent onboard charging system. 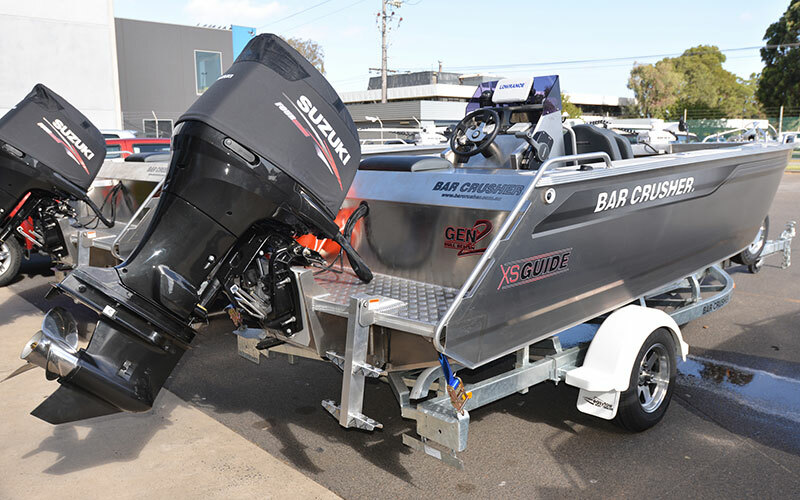 Powered by reliable and fuel-efficient Suzuki DF150 four-stroke outboards, testing of the Bar Crusher 615XS Guide series fleet delivered fully-loaded top speeds of over 40kt. “The performance and efficiency of these rigs will serve Darren, his guides and his clients very well as they fire casts at likely-looking snags in the Glyde and Woolen rivers for barra, as well as hit-up the bluewater for mackerel, tuna, GTs, cobia and other hard-fighting sport fish,” Mr Cleland said.